Explanation of what the Greenblatt Magic Formula is all about, and how the system works. The historical background is also explained. A study of how strong the Magic Formula companies are in a financial matter, compared to the 30 most traded companies in the U.S. Markets. 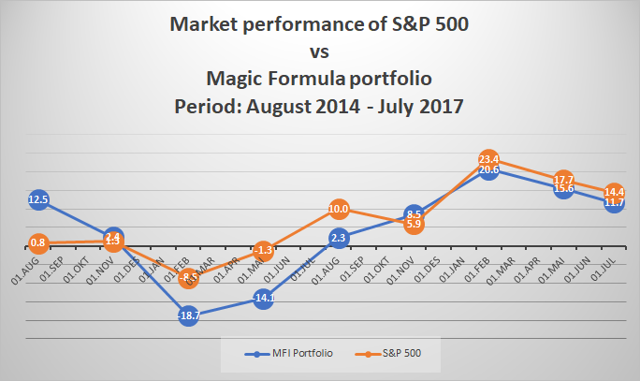 A study of the market performance of the Magic Formula companies in relation to the S&P 500 Index, during the last three years. Easy-to-read diagrams where every company in the study is included. You can have your own stocks getting ranked and compared to the most traded stocks and to the Magic Formula stocks. Are you among all those people who wonder how strong the Magic Formula Companies actually are? What their financial status are compared to the most traded companies in the U.S. Markets for example? 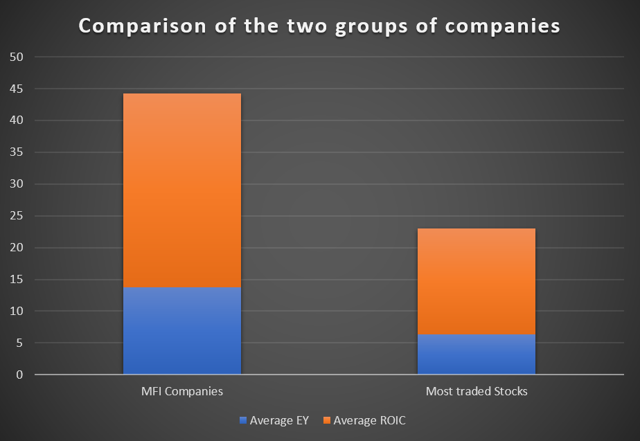 And not at least how they perform in the market compared to the most traded companies? A while ago I started to wonder about this myself, so I decided to figure it out. The Magic Formula Investing idea was first introduced by Joel Greenblatt in his best-selling book “The little book that (still) beats the Market”. The basic approach and the main foundation are built on the philosophy developed by "The Father of Value Investing", Benjamin Graham (1894-1976), the person that Warren Buffet declares as his mentor. Benjamin Graham describes his market philosophy and his investment ideas in his book "The Intelligent Investor", which is defined as a "must read" for value investors around the world. The phrase "The Magic Formula" is probably chosen to emphasize exactly the opposite: There is nothing magic about the method! Nothing magic at all. In his book (and in interviews), Joel Greenblatt states several times that the formula is so simple, logic and straight-forward that it might be difficult to take it seriously. And even more difficult to follow it as an investment strategy and put your own money into it. Is it really likely that such a simple approach is able to beat the market? The main purpose with "The Magic Formula" is that it picks above average companies at below average prices. In other words, the system is built to discover high quality companies at bargain prices. Every company noted at the U.S. Stock Exchanges are included in the system, except from banks and utility companies because of different accounting reporting. Every stock is given a score. The model uses two criterias for ranking and sorting companies (this is explained further below). The companies with the highest score are the ones with the best combination of financial strength and a low market price. The stock screener lets you choose a minimum market cap, which allows you to exclude companies that are "too small" in your opinion. Greenblatt suggests in his book that every stock is held for one year before you sell it, then you replace the money into another company that is recommended by the system. How does The Magic Formula define "company performance"? In my study, company performance is calculated in the same way as it is by the Greenblatt model, which is called The Magic Formula. There are two main indicators/criterias: Earnings Yield (EY) and Return on invested Capital (ROIC). Each of these two criterias gets a percentage number, these are added together, which then gives a total score. For example, a company like Google got an EY of 6.6% and a ROIC of 23.1%, this gives a total score of 29.7 (6.6 + 23.1). The reason that these two factors are added together into a total score, is that the first indicator (EY) gives an indication whether the company’s shares are sold at a cheap or an expensive price in the market (earnings in relation to enterprise value). The second indicator (ROIC) is an efficiency indicator which gives an indication of the company’s financial health, in other words if it is a solid company with a healthy economy. A high total score means that a solid, high quality company is available at low, bargain prices in the market. First I picked the 30 best and top selected companies between 300 mill. USD and 8 billion USD using the Joel Greenblatt “Magic Formula Investing Stock Screener” on MagicFormulaInvesting.com (MFI companies). Then I picked the 30 most traded companies on the U.S. Stock Market (by money flow / money value), using the tool on MarketVolume.com. Please note: The selection of companies was done during August/September 2017. A comparison of the financial performance (Earnings Yield and Return on Invested Capital) of every company, using the financial numbers from the last available quarter. This is the Greenblatt approach. Every company was given a score, and as a result the two groups of companies were given an average score. A comparison of the market performance of the two groups during the last three years (stock price development from August 2014 to July 2017). In "The Magic formula" group, the screener has been run and new companies have been picked every quarter during the last three years, and then kept for one year. This means that a new portfolio has been picked four times per year, totally nine times from August 2014 until August 2016. 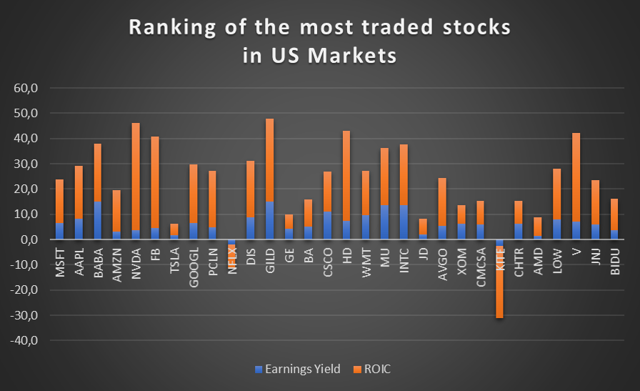 The S&P 500 Index has been used as a benchmark for practical reasons as a replacement for the 30 most traded US companies, since using the index will provide an even more correct comparison of market prices. The 30 most traded companies in the U.S. Stock Markets gave an average total score of 23 (average EY of 6.3% + average ROIC of 16.7%). The highest score among the 30 companies was 47.9 and the lowest score was -31.2. 16 of the companies had a score in the range of +/- 10 from the average total score. Results are shown in the diagram below. The 30 best and top selected companies using “the Magic Formula Investing Stock Screener” gave an average total score of 44 (average EY of 13.8% + average ROIC of 30.4%). The highest score among the 30 companies was 76.9 and the lowest score was 6.8 (the reason that this company is among the top rated companies despite its low score, is that it has a net working capital that alone exceeds its market price). 11 of the companies had a score in the range of +/- 10 from the average total score. Results are shown in the diagram below. The S&P 500 Index had an average annual return of 9.1% from 11th of August 2014 until 17th of July 2017 (35 months). 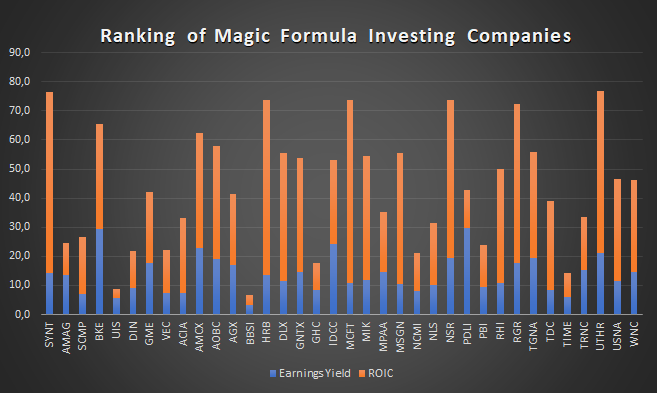 During the exact same period, The Magic Formula portfolios only had an average annual return of 4.5%. The worst drawdown for both groups was in the one year period from February 2015 until February 2016: -8.5% for the S&P 500 and -18.7% for the MFI portfolio. The best one year period for both groups was from February 2016 until February 2017: A gain of 23.4% for the S&P 500 Index and a gain of 20.6% for the MFI portfolio. In six of the nine one year periods the S&P 500 Index outperformed the MFI portfolios. It is very interesting to see that the total average score in the group with the top rated stocks in the Greenblatt model is almost the double of the average total score in the group of the most traded stocks in the U.S. Markets (44 vs. 23). In addition, it is interesting to notice that only two of the 30 companies in the group of the most traded stocks exceeds the average score in the group with the top rated stocks. This clearly shows that the Magic Formula does what it is intended to do: Pick above average companies at below average prices. Its purpose is to discover stocks with the best combination of return on capital (high quality companies) and earnings yield (high earnings in relation to market price). The numbers above are a confirmation that the formula is a valuable tool, and it completes its mission. As expected, the MFI companies in general have a higher volatility than the leading market index S&P 500. Investing in this group of stocks includes higher risk than the market overall, but you get no compensation for paying that risk. The Magic Formula companies even underperform compared to S&P 500 for the whole period in total. In only three out of nine of the one year periods the MFI portfolio outperforms the market, and only one of them in a significant manner (the first one year period with an outperformance of about 12 percent). After one year: A return of 12.5% against the S&P 500 Index with a return of 0.8%. After two years: A total return of 22.2% against the S&P 500 Index with a return of 9.1%. After three years: A total return of 22.3% against the S&P 500 Index with a return of 26.5%. This study confirms that investing in companies picked by the “Magic Formula Investing Stock Screener” should be a wise and safe choice for the true value investor (independently of the market underperformance for the period), with a minimum investing horizon of 2-5 years. Anyway, it is important to remember that stocks which are picked by the Magic Formula often have a long term negative momentum, and there is no reason why this should not continue on the short term. That is why I have developed a system where a significant rise (upturn) in the market price must be seen before the stock is taken into the portfolio. The same system also include limits for cutting losses and keeping gains. You can read more about this system here: The Stock Bargain Method. Investing in a portfolio should include of at least 8-12 stocks to minimize risk of capital loss. If you find this article interesting and of value, be sure to follow me and share it, so you and others won’t miss out on my next articles regarding value investing principles. In one of my next articles, I will look further into the Magic Formula and how it performs when cutting-loss and keep-gain principles are implemented. You also may have noticed that every company/stock is given a certain score in my study. Please let me know if you would like an analysis of a stock – just leave a comment for which company you want to get ranked, and I will provide you with this for free (limited to one stock for each individual). Which companies were included in the study? The group with the top rated companies (MFI Companies) picked by the Greenblatt model (in random order), regarding the financial performance: Syntel (SYNT), Amag Pharmaceuticals (AMAG), Sucampo Pharmaceuticals (SCMP), Buckle (BKE), Unisys (UIS), Dine Equity (DIN), Gamestop Corp. (GME), Vectrus (VEC), Acacia Communications (ACIA), AMC Networks (AMCX), American Outdoor Brands Corp. (AOBC), Argan (AGX), Barrett Business Services (BBSI), H&R Block (HRB), Deluxe Corp (DLX), Gentex Corp. (GNTX), Graham Holdings Company (GHC), InterDigital (IDCC), MCBC Holdings (MCFT), The Michaels Companies (MIK), Motorcar Parts of America (MPAA), MSG Networks (MSGN), National CineMedia (NCMI), Nautilus Group (NLS), NeuStar (NSR), PDL BioPharma (PDLI), Pitney Bowes (PBI), Robert Half International (RHI), Sturm, Ruger & Company (RGR), TEGNA Inc. (TGNA), Teradata Corp. (TDC), Time Inc. (TIME), Tronc Inc. (TRNC), United Therapeutics Corp. (UTHR), USANA Health Sciences (USNA), Wabash National Corp. (WNC). 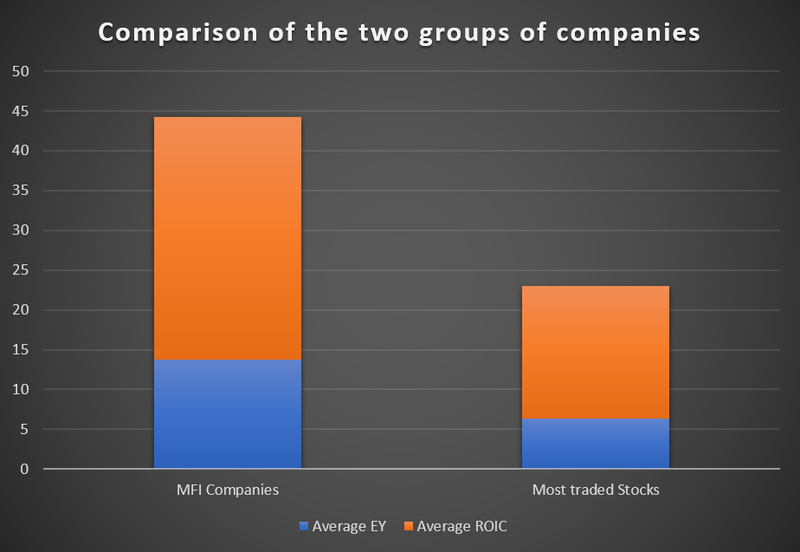 Please note, regarding the market performance of MFI Portfolios: Not all companies included in the study are mentioned here because of the amount of stocks during all nine periods. The group with the 30 most traded stocks in the U.S. markets (ranked by money flow): Microsoft Corp. (MSFT), Apple (AAPL), Alibaba Group Holding (BABA), Amazon.com (AMZN), NVIDIA Corp. (NVDA), Facebook (FB), Tesla (TSLA), Google/Alphabet (GOOGL), The Priceline Group (PCLN), Netflix (NFLX), The Walt Disney Company (DIS), Gilead Sciences (GILD), General Electric Company (GE), The Boeing Company (BA), Cisco Systems (CSCO), The Home Depot (HD), Wal-Mart Stores (WMT), Micron Technology (MU), Intel Corp. (INTC), JD.com (JD), Broadcom Ltd. (AVGO), Exxon Mobil Corp. (XOM), Comcast Corp. (CMCSA), Kite Pharma (KITE), Charter Communications (CHTR), Advanced Micro Devices (AMD), Lowe’s Companies (LOW), Visa (V), Johnson & Johnson (JNJ), Baidu (BIDU). The study was done during late August / early September 2017.